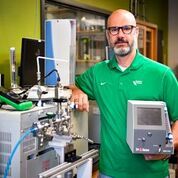 University of North Texas College of Science chemistry professor Guido Verbeck and InspectIR Systems LLC are collaborating to commercialize a system for detecting drugs by analyzing a person’s breath. The breathalyzer is about to enter the market and will initially test for tetrahydrocannabinol or THC, the principal psychoactive constituent of cannabis. Verbeck became involved with the war on drugs in 2016 when he developed a system that could locate certain chemical molecules in the air. The chemicals detected are specific to those used to create methamphetamines. Essentially, Verbeck invented the world’s first mechanical drug-sniffing “dog.” The “dog” could be installed in a car, which would then cruise an area. The more molecules detected in the air the closer the “dog” was to finding the chemicals needed to make methamphetamines. Operators could just follow the “dog’s” nose to the source. InspectIR Systems LLC based in Frisco, TX, is an innovator in the development, commercialization and application of multispectral non-contact validation, inspection and profiling technologies/devices. For more information on InspectIR Systems, visit www.inspect-ir.com.